It's that time of year again! 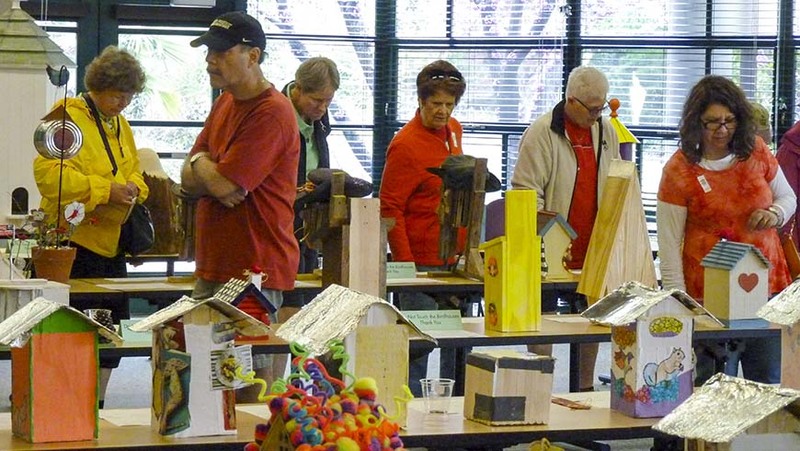 The Birdhouse Competition returns to the JC Raulston Arboretum. If making birdhouses is not your thing, then looking at them should be. The creations range from barrels of laughs to studies in craftsmanship and beauty. Pack up the whole brood and join the fun. Entries may be picked up between 9:00 am and 6:00 pm on Monday. Entries not removed by 6:00 pm will become the property of the JCRA. Open to adults and children. If you love the natural world and unique garden art, get out your sketch pad, paints, and tool box. The competition is a wonderful opportunity to raise awareness about bird habitats, while expressing your own creativity. Each participant may enter more than one birdhouse. There's no limit. Note: Birdhouses entered into the Serious category can best be described as working birdhouses. They will be judged using the criteria listed above in the order they are listed. Note: Birdhouses entered into the Flights of Fancy category can best be described as decorator birdhouses. They will be judged using the criteria listed above in the order they are listed. Please note the order in which the judging criteria are listed. These are listed in the order of importance for each category. All entries should be portable. Most entries should be able to stand alone when placed upon a display table. If they cannot stand on their own, please bring a stand to help display the birdhouse. Large birdhouses should be equipped with their own stand that can support the birdhouse in an upright position on a floor. As much as possible, children's entries should be prepared by the entrant. Six judges, three for the adult categories and three for the youth categories help judge the entries. Judges have a creative background (e.g., woodworking, ceramics, etc.) or are birders. Youth judges typically have a youth education background. If you're interested in helping us judge this year's competition, please contact Chris Glenn at (919) 513-7005 or chris_glenn@ncsu.edu. All guests are invited to judge the birdhouses on Saturday. Use your spare change to vote for your favorite birdhouses. There's no limit. Vote for as many as you wish. Each 1¢ is worth one vote. Winners of the Visitor's Choice Awards will be announced on the JCRA's Web site and our Facebook page. Raulston Blooms! tickets will be provided everyone that enters a birdhouse in the competition. Invite your entire family to attend the event and see your birdhouse in the competition, shop the Spring Plant Sale, and enjoy Raulston Blooms! The JC Raulston Arboretum would like to thank the Triangle Gardener for being the birdhouse competition's media sponsor. Proceeds from Raulston Blooms! benefit the daily operations of the JC Raulston Arboretum. Raulston Blooms! is sponsored by and fund-raising efforts operate under the auspices of the North Carolina Agricultural Foundation, Inc., a 501(c)3 nonprofit (tax ID 56-6049304). Cost to enter competition: free. Birdhouse builders receive a free ticket to attend Raulston Blooms! Raulston Blooms! admission: free for members, $5.00 for nonmembers, $10.00 per family. Raulston Blooms! admission includes admission to the birdhouse competition and plant sale, too. Advance registration is encouraged. Please register online using our registration e-store. Onsite registration is available on Friday, April 5. Ruby C. McSwain Education Center at the JC Raulston Arboretum at NC State University, 4415 Beryl Road, Raleigh, North Carolina. Please call (919) 513-7005 for more information about this event.